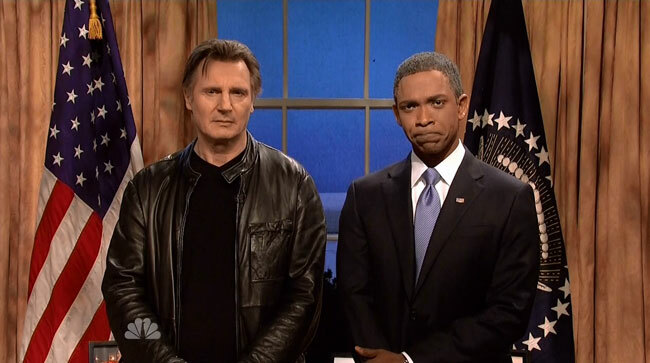 Liam Neeson made a guest appearance on Saturday Night Live to advise President Obama (Jay Pharoah) about Taken back the Ukrainian republic of Crimea. Neeson warned Russian President Vladimir Putin that he has a very particular set of skills as a Hollywood actor, which include giving Obama a manly makeover for an American propaganda film. It features Putin like stunts such as a shirtless Obama riding a horse and wrestling a bear but with better production values.